I've always wanted a garden sink. I remember wanting one as a child even. Is that weird? I have no idea why I wanted to wash up outside so badly but I've finally got a home of my own and the garden we've built surely justifies a garden sink, right? Now let me break it down for you. The sink basin is just a small square bucket with a hole cut in the bottom and one of those food-catcher drain thingies dropped in. We had 3 but only needed 2 so I raided the cabinet under the kitchen sink and donated it to the cause. That smaller bucket sits in a larger bucket so the water falls into that. 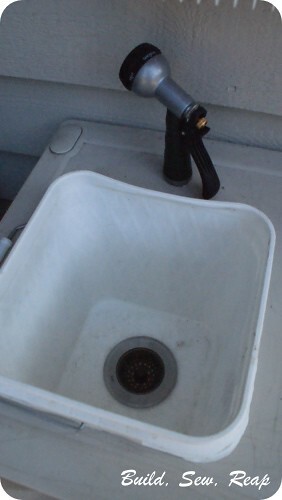 Now, this sink isn't for washing paint off our hands or any other bad stuff, this sink is for washing dirt from our hands after a day of gardening. 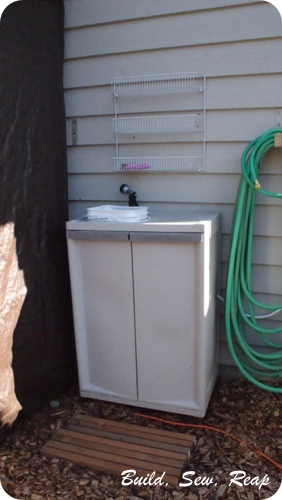 It's for rinsing vegetables after harvesting them for dinner. 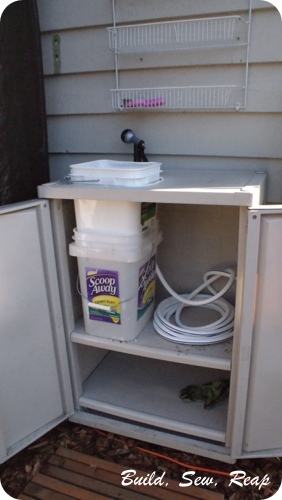 When the washing is done, the bottom (scoop away) bucket can be removed and emptied on a garden bed or into the rain barrel to be used instead of wasted. The white hose you see coiled there is a special boat hose that is more pliable than a standard hose, shorter and doesn't contain chemicals that would make drinking the water from this particular location unsafe. I grew up drinking from the hose and I'm pretty sure it's ok on occasion but the fact that it's definitely safe means I feel better about washing our food here. I picked up a nozzle for it then drilled a hole in the top of the cabinet to feed the hose through. 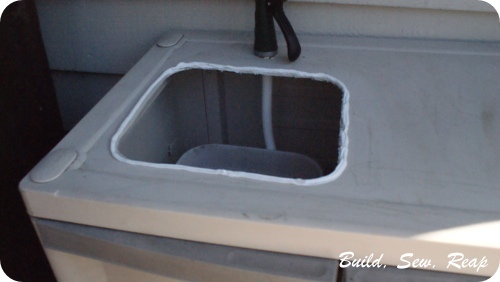 One detail you can't see though is that I added a (wobbly) line of caulking around the edge of the hole for the sink. I wanted to be able to remove the top bucket for various reasons so I didn't want to caulk it into place but I did want to minimize the amount of water that would run from the top of the counter area into the cabinet so I just added a thick line of caulking all around and allowed it to dry before putting the bucket into place. I'm sure it won't be perfect but it'll help. I also added a little rack to the wall above the sink so we can put a nail brush, maybe some baking soda (to scrub our hands with) and perhaps a cup or two for quick drinks.